GALION — Marcia Yunker has an eye for history, and an ear for music. As a board member of the Galion Historical Society, she was looking through some of old photos one day and noticed something that piqued both her interests. Yunker published a book a few years back called “Images of America, Galion,” which is for sale at the historical society and was was doing some more research when she came across the photo. She has looked at a lot of historical pictures. But this one was different. For several weeks after that, Yunker, is retired as a history teacher with Galion City Schools, did research. A lot of it. If the Freese name sounds familiar, it should. The Freese Foundation was set up and established by the family and provides an annual endowment for projects in the City of Galion that help make the city a better place to live. Some of that funding in recent years has been used to help fund improvements at Galion’s parks, most recently the athletic fields and new pressbox at Heise Park Stadium. 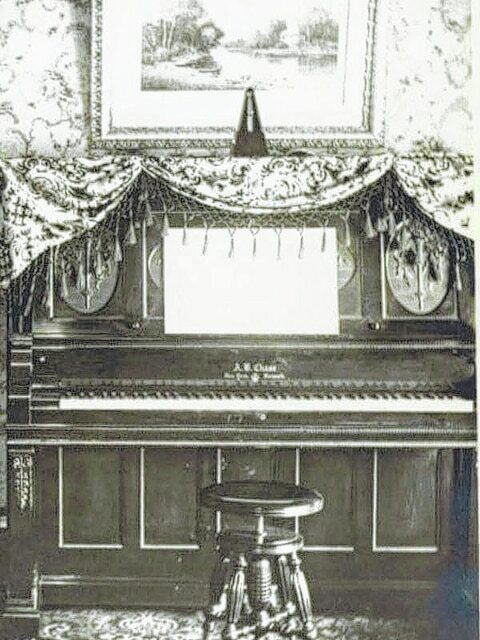 Well, the photo led Yunker on a quest to learn more about the Freese family: Where they lived, who they were related to and was there a reason that piano resonated with her. After a lot of research that included figuring out the maker of the piano and even the approximate time of when it was built, she thinks she figured out what piqued her curiosity. But she’s not telling anyone … just yet. She unveil what she discovered in about nine days. To that end, she posted a video on the historical society website, that has since been shared far and abroad. It it, Yunker offers up a few hints as to the mystery of the piano, but only enough to pique more interest. The Galion Historical Society is at 132 S. Union St. The church is right across the street. In the past, the historical society offered regular lectures on the history of Galion and Galion natives. If successful, Yunkers presentation may be a prelude to similar meetings in the future. She does have at least three other presentations planned in coming months. But Yunker added, “The mystery of the Freese piano” will be a delightful surprise to many. Car show — Sunday, Sept. 25, 1-5 p.m. at the former site of Galion Middle School. This year’s car show will be in memory of Bob Muth. Foo all makes, models and years. Door prizes, a 50/50 raffle, music and concessions. “The Mystery of the Freese Piano” — Sunday, Oct. 2, 2 p.m. Historic Grace Church, across the street from the historical society. Paranormal Hunts at Brownella Cottage — The cottage will be open to the public Sept. 24, Oct. 8 and 29, Nov. 12. $25. Reservations at 419-462-5672.